23.4.1930 - 2.4.2019 Passed away peacefully 2.4.2019, leaving behind his devoted wife Marion, son Cliff and Pam, and grandson Dean. 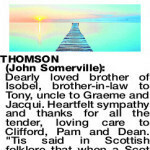 Brother of Dan and Dorothy (both dec), Isobel and Tony, Uncle of Jacqui, Susan, Cathy, Ross, Graeme and their families. Devoted to his family, he always had their best interests at heart throughout his life. 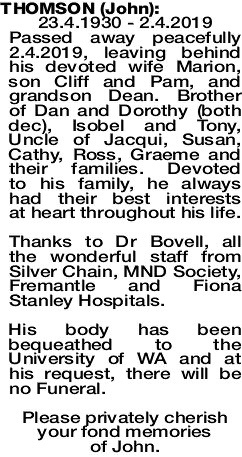 Thanks to Dr Bovell, all the wonderful staff from Silver Chain, MND Society, Fremantle and Fiona Stanley Hospitals. His body has been bequeathed to the University of WA and at his request, there will be no Funeral. Please privately cherish your fond memories of John. 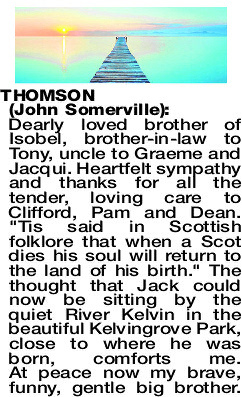 Dearly loved brother of Isobel, brother-in-law to Tony, uncle to Graeme and Jacqui. Heartfelt sympathy and thanks for all the tender, loving care to Clifford, Pam and Dean. "Tis said in Scottish folklore that when a Scot dies his soul will return to the land of his birth." The thought that Jack could now be sitting by the quiet River Kelvin in the beautiful Kelvingrove Park, close to where he was born, comforts me. At peace now my brave, funny, gentle big brother. Beloved Poppy of Dean. He taught me the value of knowledge - the most important lesson I have ever learned. 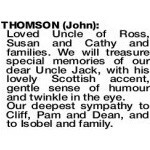 Loved Uncle of Ross, Susan and Cathy and families. 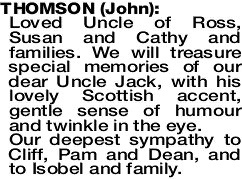 We will treasure special memories of our dear Uncle Jack, with his lovely Scottish accent, gentle sense of humour and twinkle in the eye. Our deepest sympathy to Cliff, Pam and Dean, and to Isobel and family.